A Notice of Public Meeting Tuesday December 12, 2017 has been issued by the Township of Lake of Bays relative to the planning application of Haystack Bay Marina. You may recall that this application was before Council in August of 2016 and Council deferred their decision pending a reduction in dock length and submission of fisheries report. As per the resolution of August 9, 2016, the applicant has submitted a revised proposal to rezone the subject lands by amending the Waterfront Resort Commercial with an Exception “(WRC-E26) Development Permit Area and Waterfront Resort Commercial with an Exception “(WRC-E27)” Development Permit Area. If you oppose or agree with this application and wish for your voice to be heard you must either attend and speak at the December 12, 2017 meeting or provide a written submission prior to the public meeting (we recommend providing written submissions by the Friday before the meeting to ensure it is included in the staff report and Council’s meeting package). You should ensure your letter references the application, e.g. RE: Notice of Public Meeting Respecting a Site Specific Amendment to development Permit By-Law No. 04-180 – Being Application Z 19/16 LOB (Grant – Haystack Bay Marina). Also, if you have not yet joined the PCRA, we would value and appreciate your support. The Port Cunnington Ratepayers Association is an incorporated not for profit organization with a mission to support the safe enjoyment and sustainable development of Port Cunnington Peninsula. 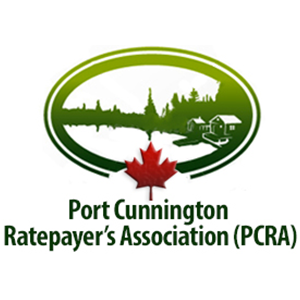 More information and membership application can be found at portcunnington.ca/join-pcra.